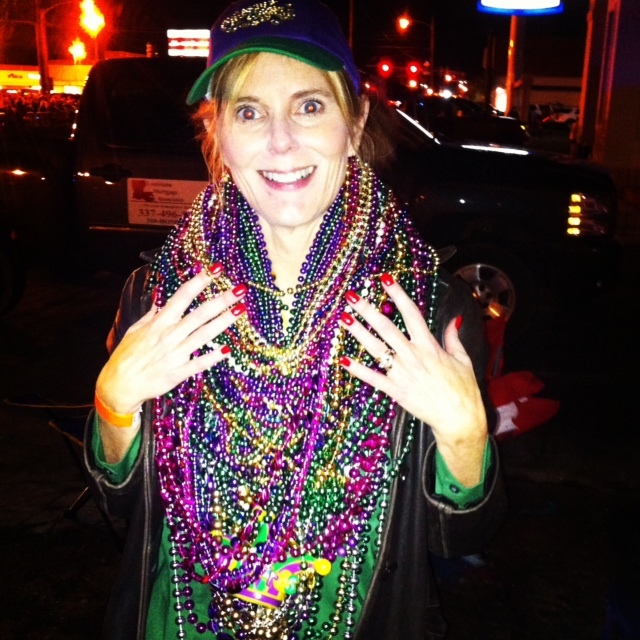 Let me share some tips with you about catching beads and throws during the Lake Charles Mardi Gras Parades. Over the last 30 years, I've attended the parades as a parent with small children, a float rider, and an adult parade watcher on the sidelines! Lake Charles has a Mardi Gras Children;s Day with a Children's Parade that follows. This year Children's Day is Sunday, February 15 2015 from Noon-3pm at the Lake Charles Civic Center. The Children's Parade will immediately follow from the Lake Charles Civic Center at 3:30pm. Throws you can expect to catch during the Children's Parade include beads and lots of candy! The Mardi Gras floats will have children riders with their parents. Many of the children will be throwing from the floats and they can't toss very far, so being on the frontline of the parade route helps your chances of catching something on this particular day! The Merchant's Parade is Friday, February 13th at 7:00pm. This Lake Charles Mardi Gras Parade will also begin at the Lake Charles Civic Center. 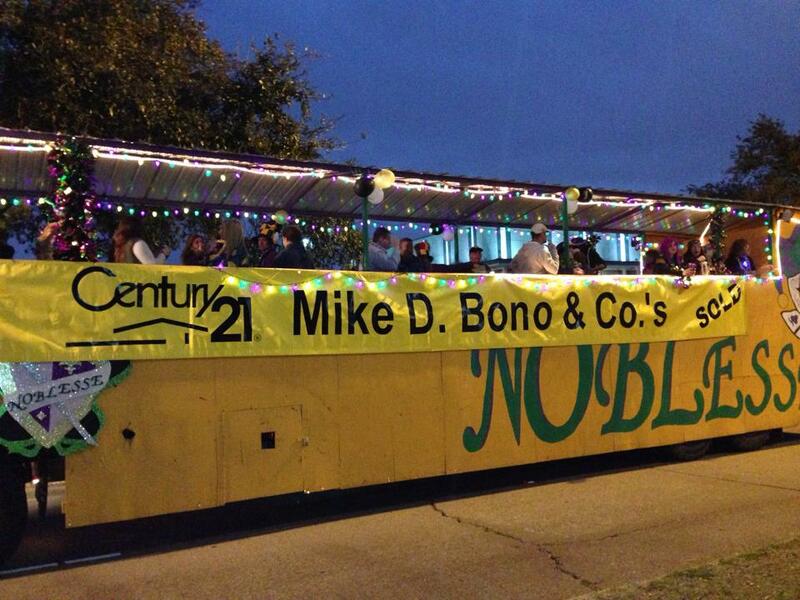 Once again, I'll be riding on the Century 21 Mike D Bono & Co.'s Mardi Gras Float. Floats are usually playing loud music and the float riders don't always hear you call our name so parade watchers have to do something else to catch our attention in order to have us throw something special to you! If you are in the spirit dancing and having fun we are more likely to throw directly to you! Lake Charles Merchants usually have lots of goodies to throw to the crowds so you can expect, cups, key chains, candy and beads! The Merchants Parade is also family friendly so many residents bring their children. If you see me, be sure to wave and get my attention so I will throw you something special! Krewe of Krewe Parade the highlight and culmination of the Mardi Gras season . This year the Krewe of Krewes parade will be February 17, 2015 at 7PM. The Krewe of Krewe Parade begins at the Civic Center and goes all the way down Ryan Street to the corner of Ryan and Sale where it ends at McNeese State University. 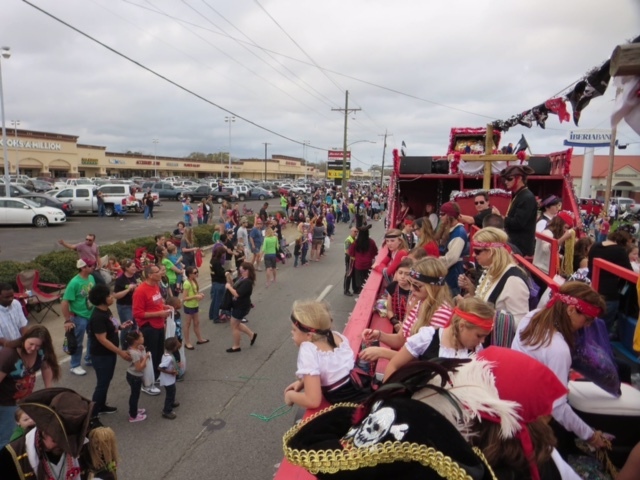 The key to catching great beads and good throws is being closer to downtown on Ryan Street where the floats make the turns from the Civic Center or mid-route on Ryan Street in front of the Books-A-Million Shopping Center or on the side of Louisiana Mortgage Associates. The Mardi Gras Floats usually have pegs or hooks on the inside the float. It takes awhile to untangle the beads and re-load to start throwing to the crowd again. Because riders are so high on the floats they tend to throw further back to the crowds. Many parade goers will hold up umbrellas to catch the beads as they fly through the air! Its not uncommon to see parade attendees sitting in parked trucks close to the parade route, the throws find their way inside the beds of the trucks too! Most of the Krewe Members riding on the floats will be in costumes and masked so you may not recognize friends and co-workers who are in the Krewe of Krewes parade. TIPS FOR CATCHING THE MOST MARDI GRAS PARADE THROWS! The key to catching the most throws is letting people who are riding in the parades know where you will be standing so they can be on the lookout for you. If you know your friends are in a Krewe and will be on a float send them a text before the parade ! Location and fun are the elements of success. Get There Early Parade routes can look empty one moment, but the crowd size can swell fast within an hour or two of the parade. Wear Mardi Gras Colors What better way to celebrate Mardi Gras than by wearing its traditional colors of purple, green and gold. Catch Mardi Gras throws! Enjoy jumping up to catch beads, doubloons, cups, stuffed animals--whatever! Yell at the float riders "Throw me something, Mister!" Bring a large, sturdy plastic or cloth bag to hold all the treasure you'll be catching wearing all of your beads around your neck gets heavy and you may have a hard time standing up straight! Be prepared: some people get so overcome with excitement they will occasionally jump in front of you to grab what a rider has thrown to you. Don't get into a tug-o-war....there are many more floats on the way! If you're from far away, bring a sign saying where you are from. It may garner the float's attention. 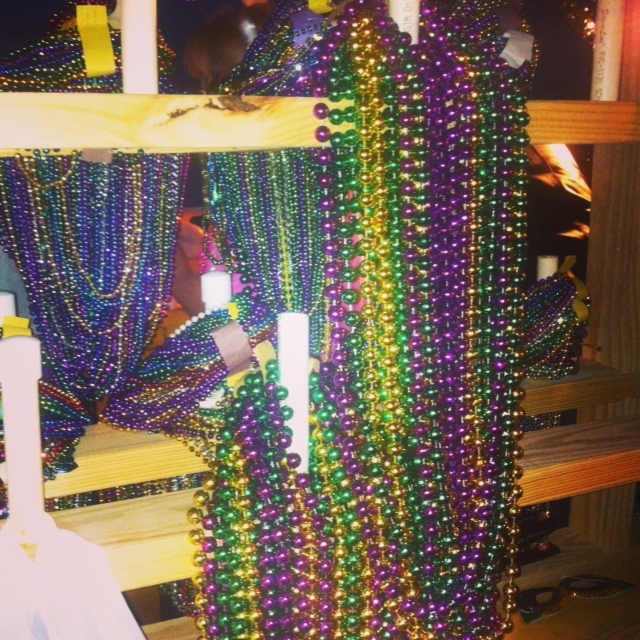 Don't reach down to pick up beads, doubloons, etc. unless you are very careful! Put your foot on it, and when it's safe (between floats), you can bend down to pick it up. Do not run into the street between floats for a trinket! Floats cannot stop on a dime. Plan your meals ahead. Many restaurants along the parade route will close or not allow entry or departure during the parades. You may opt to eat street vendor food, or pack your own snacks and sandwiches. It will be a long day, so plan ahead! Also, bring wet wipes or tissues with you to clean up before eating. Your hands will get very dirty, and it won't be easy to find a sink and soap. Mardi Gras is a holiday here in Southwest Louisiana. The Courthouse, banks and many offices are closed on Mardi Gras (Fat Tuesday). Since no closings are taking place, even a Realtor like me can join in the fun of the day! 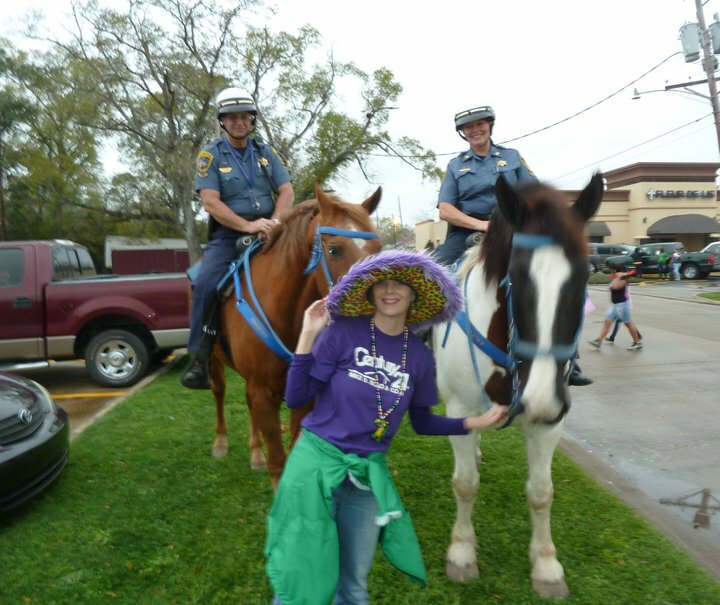 For more information on Southwest Louisiana Mardi Events visit the Mardi Gras information page. 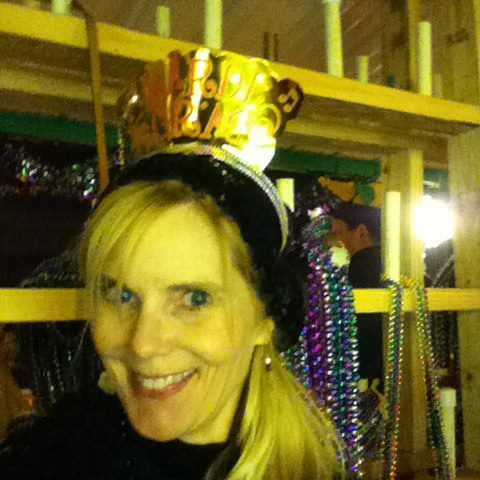 HAPPY MARDI GRAS FROM MARILYN BOUDREAUX, CENTURY 21 MIKE D BONO & CO.'S!